Effect: Each time you or your opponent activates 1 Spell Card, put 1 Spell Counter on this card (max. 3). You can Special Summon 1 "Dark Magician" from your hand, Deck, or Graveyard in face-up Attack or Defense Position by offering this monster with 3 Spell Counters as a Tribute during your Main Phase. 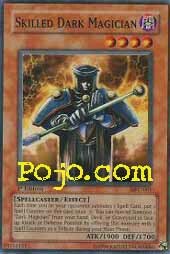 Today's COTD is based on a major Dark Magician supporter. Skilled Dark Magician is what most most people will associate spell counters with. Breaker doesn't count since you only see 1 on him at a time. Basically, you get a 1900 4-star attacker with a nifty effect. The 1900 attack is good enough to use alone, and the effect can easily thin your deck for a 2500 attacker. Of course, this is also a great way to get Dark Paladin out faster, as speed magicians always help. Constructed: 4/5- This is pretty much a must in any standard spellcaster or dark magician deck. It's also a great monster alone, and its super rare status makes it easier to get over gemini and sapphire/luster, and it lasts longer than Spear Dragon. Limited: 5/5- In limited, a 1900 attacker is a GOOD thing. Use it immediately. Sealed deck also loves this card. Not much is going to kill a 1900 4 star attacker, and yugi starters will prosper from this guy's effect. Skilled Dark Magician is by far the only tournament worthy Monster that has to do with the whole Dark Magician theme in the English environment. Don't let anyone tell you otherwise. Contrary to what most of the reviewers said about yesterday's Fusion Monster, it's a horrid card. Don't even consider using it in anything but casual play. Anyways... Skilled Dark Magician is a very solid Monster. Very nice stats with a decent Effect to back it up. There's almost no reason not to throw a single copy of Dark Magician in your deck if you're running 2-3 copies of this Monster. At best, you can simply discard the Dark Magician via Graceful Charity, Painful Choice, and Tribe-Infecting Virus. All of which you should undoubtedly be using if you're running Skilled Dark Magician with Dark Magician tech. Skilled Dark Magician is broken is any sealed deck as well. The stats will blow 90%+ of the Common Monsters out of the water. Not much besides using cards that produce Spell Counters. Well, this card would obviously be used for Spellcaster/Magician/Paladin Decks, but if you just want another Lv.4 1900 attacker then his Effect can just be ignored. When cards like this come out it makes you wonder why Gemini Elf was even a Secret Rare, but I guess since she was the first they wanted to make her a little hard to get. The whole "Deck, Hand or Graveyard" thing is very helpful, especially when trying to Summon Dark Paladin, but there's always the chance that SDM will get destroyed before you can get 3x Spell Counters on him. Not much more I can say besides that he's a Lv.4, 1900 ATK Monster with an Effect to speed up Dark Magician/Dark Paladin Decks. ArtWork: 2.5 - Eh, he looks ok, but I like the nice lightning effect in the background better.